Dear Los Angeles features snippets of diary entries and letters written between 1542 to 2018. 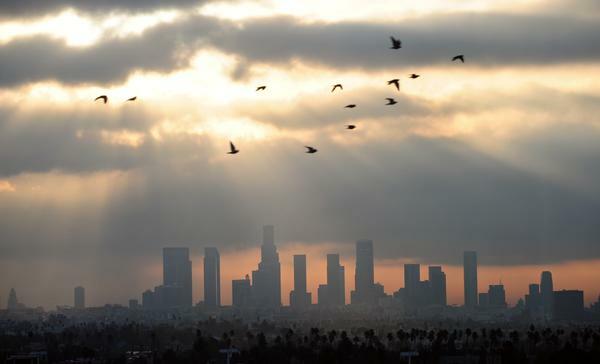 Above, daybreak over downtown LA in December 2011. Love it, hate it, or just hate the traffic, everyone has an opinion about Los Angeles. A new literary olio gathers hundreds of those opinions together, in a book called Dear Los Angeles: The City in Diaries and Letters, 1542 to 2018. Editor David Kipen has dug up centuries' worth of excerpts about California's largest city. The book, he says, is "a collective self-portrait of Los Angeles when it thought nobody was looking." The excerpts he's picked roughly divide up between Los Angeles as heaven and Los Angeles as hell. It was hell for novelist William Faulkner, who came to town to write movies. "This is a strange and curious place," he wrote to his agent in 1942. And it didn't grow on him. He was homesick, Kipen says. "At least I can't be any sicker tomorrow for Mississippi than I was yesterday," Faulkner wrote in '45. Half a century earlier, when LA was covered in orange groves, a visitor named Harriet Harper felt enchanted by the place: "There is something in the crisp, rarified air of this pretty city that acts like a stimulant upon the human system," Harper observed in May, 1888. In keeping with the LA sunshine, the book's excerpts are organized into one calendar year — January to December — but they jump back and forth between the years, decades and centuries. In 1931, Albert Einstein spent a long semester at Cal Tech and was charmed by Pasadena: "It is like paradise," he wrote. "Always sunshine and clean air, gardens with palms and pepper trees and friendly people who smile at one and ask for autographs." Many of the excerpts in the book are written by people who were lured to Los Angeles by the film industry — but Kipen says he didn't want movies to dominate his book. Still, you'll find studio head Jack L. Warner scolding his writers for not getting to work on time — "It is not asking too much for a writer to be at his desk sometime between 9:00 a.m. and 9:45 a.m.," he wrote in 1937 — and Marilyn Monroe, just a few months before she died in 1962, sending a note to Germany's consul in LA: "Thank you for your champagne. It arrived, I drank it and I was gayer." Over the centuries, visitors to LA found they just had to write about it — some loved it, others did not. Faulkner declared in 1945, "I don't like this damn place any better than I ever did," and the following year Eleanor Roosevelt marveled from the air: "The city lies below you like a multi-colored heap of jewels." Expressions of love and loathing are all addressed to one extraordinary city in Dear Los Angeles. In many ways, the business of Los Angeles is storytelling. And this hub of the American entertainment industry has a unique story of its own, which is told in a new book called "Dear Los Angeles: The City In Diaries And Letters." Editor David Kipen found centuries' worth of writings about the place and created a tome that is, in his words, a collective self-portrait of Los Angeles when it thought nobody was looking. NPR special correspondent Susan Stamberg looked at the city and the book and recorded some excerpts. SUSAN STAMBERG, BYLINE: An actor - OK, my son, Josh Stamberg - reads something a great American novelist wrote to his agent. JOSH STAMBERG: (Reading) This is a strange and curious place - William Faulkner, 1942. S STAMBERG: In 1888, visitor Harriet Harper had a more positive view. Actor Myndy Crist reads her words. MYNDY CRIST: (Reading) There is something in the crisp, rarefied air of this pretty city that acts like a stimulant upon the human system. S STAMBERG: LA as heaven, LA as hell, LA as the place visitors have to write home about. As early as 1542, Spanish explorer Juan Cabrillo put this in his ship's log. DAVID KIPEN: (Reading) Came to the mainland in a large bay, named it Baya de los Fumos - that's the Bay of Smokes - on account of the many dark billows seen there. S STAMBERG: Probably from cooking fires. Editor David Kipen is reading the earliest entry in his book. KIPEN: (Reading) It is an excellent harbor, and the country is good with many plains and groves of trees. S STAMBERG: The most recent entry, written last year, is by Julia Campbell, one of Kipen's students. KIPEN: (Reading) This country definitely isn't perfect, but there are a lot of great people here that I trust to keep the country growing. She's a UCLA undergraduate and in a way the landscape is as new to her as it was to Cabrillo. S STAMBERG: We ask Kipen to meet us in LA's Koreatown at a strip mall, as much a symbol of the city as freeways and the Hollywood sign. KIPEN: The strip mall is an incubator of mom-and-pop capitalism, but it's also a kind of entry point for immigrant lives. S STAMBERG: So many came from somewhere else and found it heaven. J STAMBERG: (Reading) Here in Pasadena, it is like paradise, always sunshine and clean air, gardens with palms and pepper trees and friendly people who smile at one, ask for autographs - Albert Einstein, 1931. KIPEN: Einstein was very happy here. He spent a long semester at Caltech, but, sadly, he wound up at Princeton at the Institute for Advanced Study. And I would like to think in the dead of winter, he would sometimes ask himself, why did I ever leave Caltech? S STAMBERG: William Faulkner, on the other hand, found LA hell. J STAMBERG: (Reading) I don't like this damn place any better than I ever did. That's one comfort. At least I can't be any sicker tomorrow for Mississippi than I was yesterday. KIPEN: He was desperately homesick. He wanted to be back with his horses in Oxford, Miss. S STAMBERG: Faulkner came to Hollywood to write for the movies; so did F. Scott Fitzgerald. He was desperate for money to put his daughter through school. In 1939, Fitzgerald sent a pleading telegram to his agent. J STAMBERG: (Reading) Please answer about tuition money. Stop. You have no idea how much a hundred dollars means now. S STAMBERG: Movies drew in writers, but there is not much about movies in "Dear Los Angeles." There is one major star. She wrote to Germany's consul in LA. CRIST: (Reading) Marilyn Monroe, 1962 - thank you for your champagne. It arrived, I drank it, and I was gayer. S STAMBERG: Moviewise, there's also an all-too-frequent complaint from studio head Jack Warner in 1937. J STAMBERG: (Reading) It is not asking too much for a writer to be at his desk sometime between 9 a.m. and 9:45. Even the elite in any other business come to work earlier than that. Therefore, I must insist that more regular hours be kept in the future by those of you who have been coming in late and leaving early. S STAMBERG: Ew. Editor Kipen says he didn't want the movies to dominate his book, so he included writings by an opera singer, a general's father and a president's wife. CRIST: (Reading) Eleanor Roosevelt, 1946 - in flying into Los Angeles, we had snow-capped mountains on either side of us and soft, white, billowy clouds underneath. It was really a beautiful sight. But the most impressive time to fly into Los Angeles is at night when all the lights are on and the city lies below you like a multicolored heap of jewels. KIPEN: You don't necessarily think of Eleanor Roosevelt as being susceptible to such emotional, visceral glories, but she's rhapsodizing about the place. S STAMBERG: As if she were falling in love with it, as so many did and do. They're still coming every day and often writing home about it. Lots of what's been written so far is collected in David Kipen's book, "Dear Los Angeles: The City In Diaries And Letters." INSKEEP: Susan Stamberg on NPR News. (SOUNDBITE OF JERRY GOLDSMITH'S "LOVE THEME FROM CHINATOWN") Transcript provided by NPR, Copyright NPR.